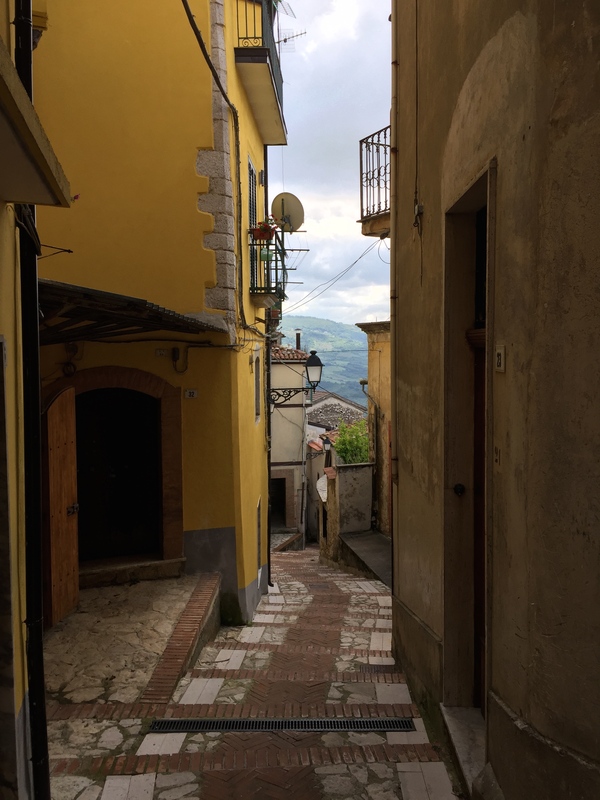 Castelcivita Italy – A scary ride! 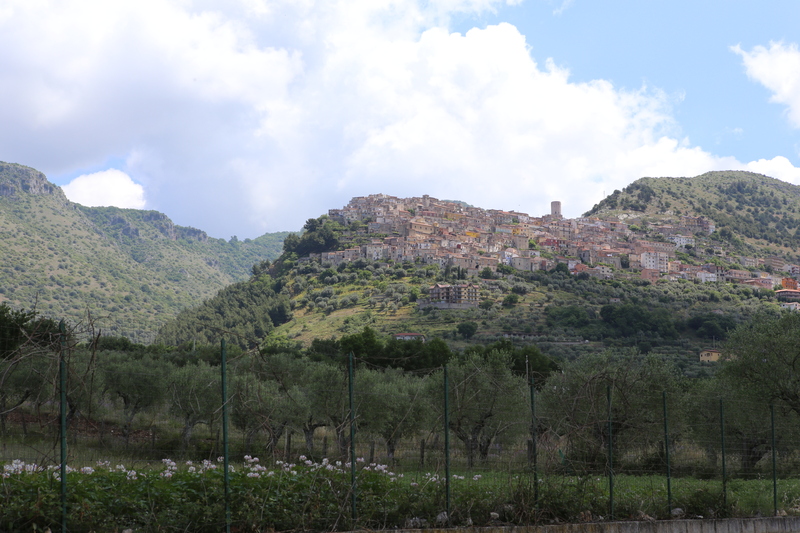 Castelcivita is a small mountain town in southern Campania, Italy. 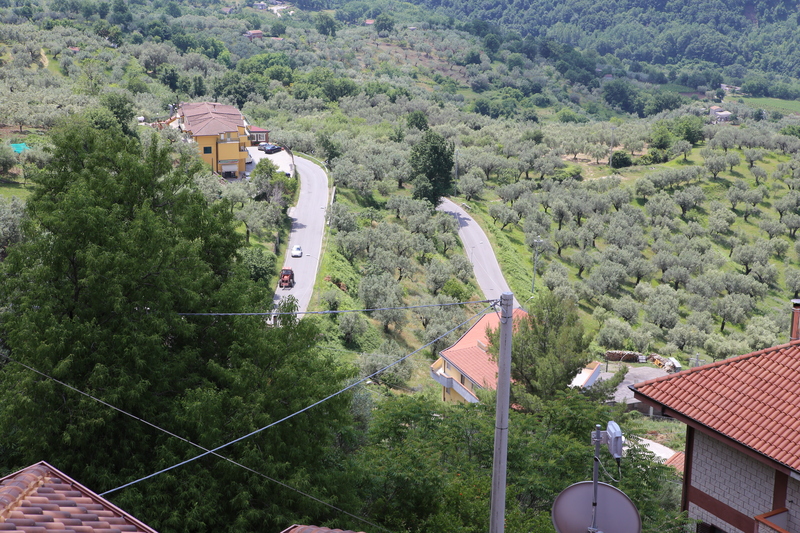 It is East of Paestum in the mountains. This is a story of why not to listen to your GPS. On the trip up the mountain the GPS told us to turn right onto a small dirt road twice. We ignored it and finally were approaching Castelcivita. We saw a sign to Castelcivita to the left but our GPS said go straight. We followed the GPS. Soon the road became a very small road. At a hair pin curve it turned to a dirt road on a 1,000 foot cliff. We knew this had to be wrong but how could we turn around? The cliff was on the left and a hill going up on the right. There was a small flat area and we turned around very cautiously. As we got back to the main road, we vowed to always follow signs over the GPS. 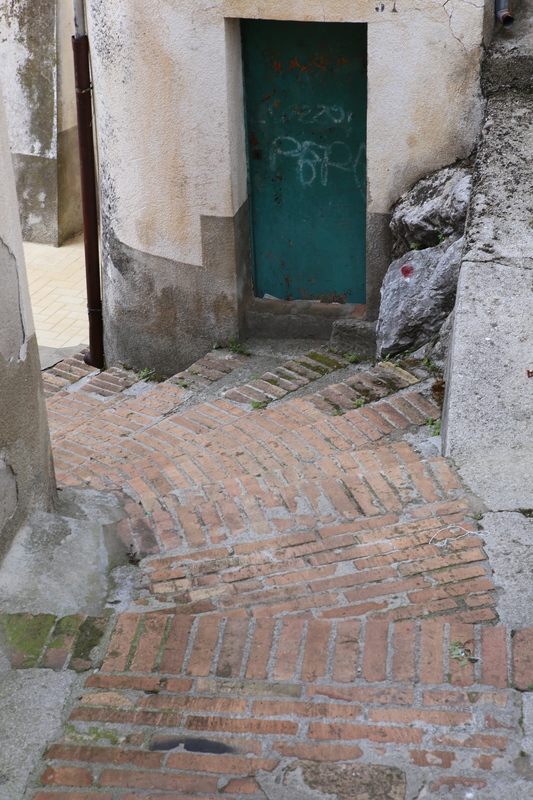 Soon we were in Castelcivita, a very small city mainly of stairs. 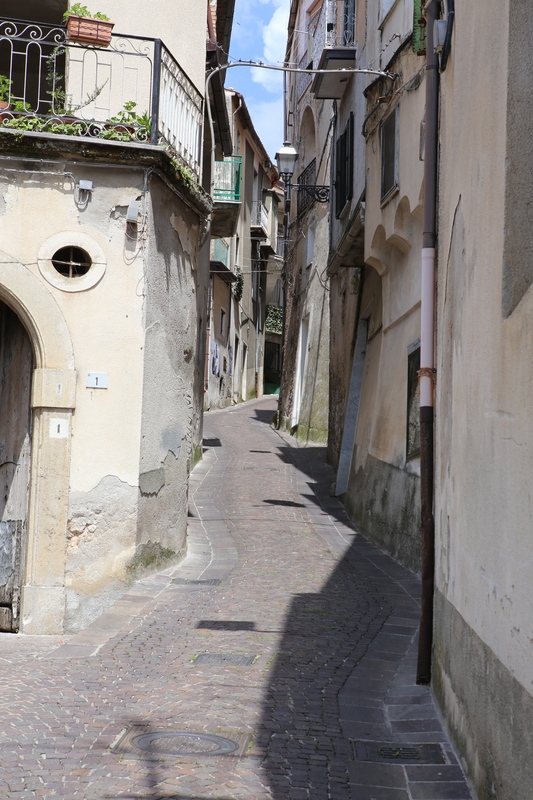 The road went up a hill and we had a choice, a hair pin curve onto a very small street or straight into a small piazza. After the GPS experience we went straight. This was an area big enough to easily turn around. There was no parking in the piazza but on the road in we saw parking along the road. We parked and walked back into the piazza. The view of the road up to this city was spectacular. This is a very unique mountain city. 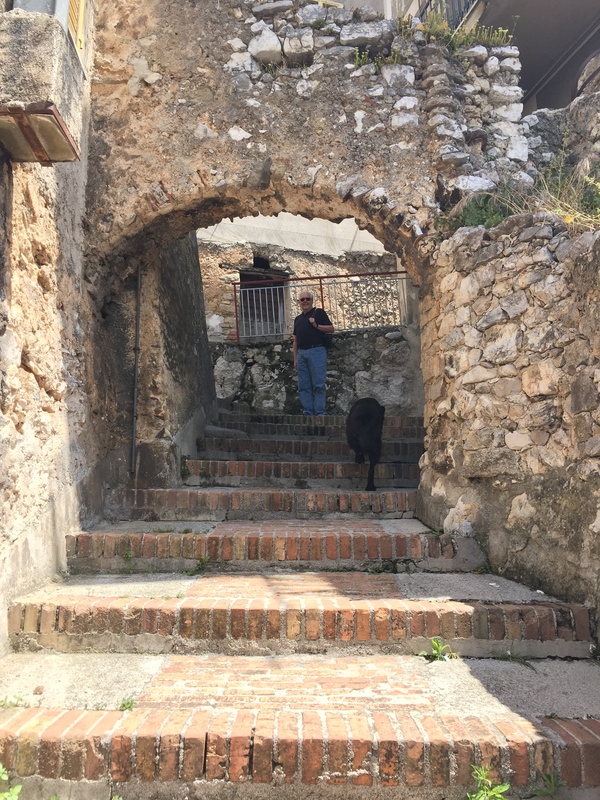 No shopping and not many restaurants but a lot of stairs going up … up to the castle at the top. We stopped at a bar to chat with the locals and get our bearings. They told us to climb some more. George made friends with a local dog. and soon we were in a small piazza at the very top of the city. 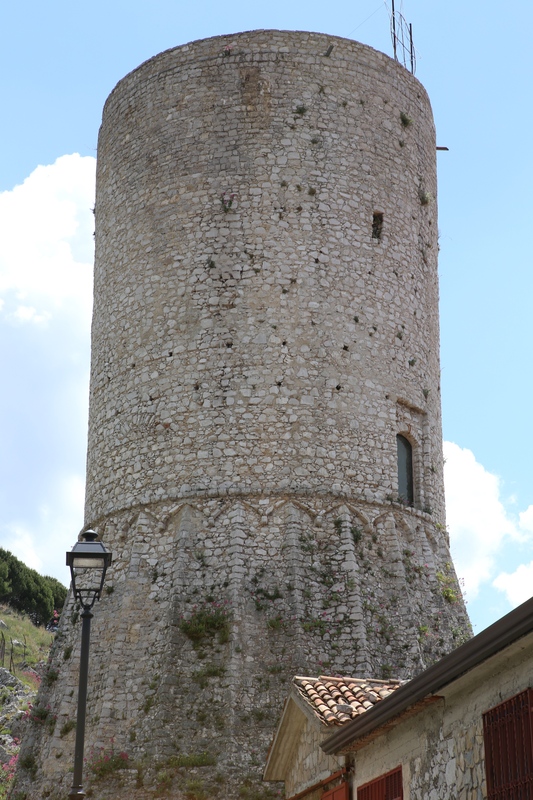 Here was an old castle tower. Now the easy part, it was all downhill to the car. It was a scary drive at first but it was wonderful to see this city untouched by tourism. Tomorrow we drive down the mountain and visit Paestum, the ancient Greek city.